An incredible new adventure tour in the tradition of sustainable tourism! This tour will take you to the seldom visited but well-preserved Ek Balam Mayan Ruins site, where your expert guide will share with you the legends and history of the Mayan Empire. The adventure continues with an exciting rappelling adventure, into an underground cenote (there are stairs for the less adventurous). You'll have an opportunity to cool off in the underground river, while admiring the amazing limestone formations, stalactites and stalagmites. Swing from Tarzan's vine or ride a zip line into the cool, clear waters. The tour will conclude with a visit to a local restaurant, where you'll enjoy Mayan delicacies for lunch. Here we can also watch local Mayans work their art, explore the gardens or relax in hammocks. Explore the Mayan Ruins site of Ek Balam, and climb Xibalba, the highest pyramid in the Yucatan! 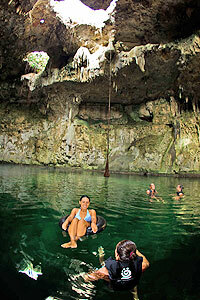 Feel a rush of adrenaline as you rappel into an underground river, called a cenote! Enjoy a delicious lunch in a Mayan Restaurant, where you can watch handicrafts being made, wander beautiful gardens or relax in hammocks. Cruise Passengers: We're sorry but this tour is too long for most cruise ship schedules. For Mayan Ruins we recommend to visit Tulum instead - it's closer. When: Mondays, Wednesdays and Fridays from 7:45 AM to 5:30 PM. Kids: Ages 6 and up. Kids prices apply to ages 6-12 years. Notes: Some days we may visit Cenote Maya first, other days we visit Ek Balam first. Ek Balam is about a 2 hour to 2.5 hour drive from Playa del Carmen. Extra money for photos, videos, drinks, or souvenirs. Restrictions: This expedition is not recommended for people with severe back problems, any severe physical or motor handicap, serious heart problems, or for obese people or for those who suffer from claustrophobia or do not know how to swim. Children under 6 years, pregnant women and people under the effects of alcohol or drugs will not be permitted to participate in this expedition. Weight Limit is 264 lbs (120 kg) for the Zip Line, Rappelling and Tarzan's Vine. People over the weight limit can still do the rest of the tour.